The goal was to get the same result but for cheap! 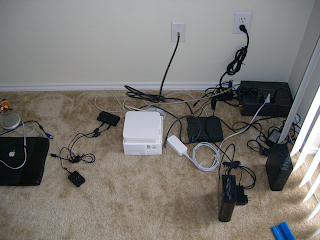 I was really surprised how much neater the room looks by just stuffing the majority of the cables in a box, rather than have them running wild all over the place. You really do keep all your devices on the floor? I'd imagine this could be easily improved upon by simply finding an opaque container (at least, that would improve it for me). honestly, i think that looks awful. 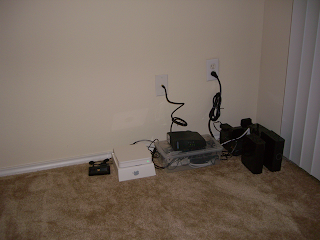 hopefully you don't do any vacuuming, keeping your devices on the floor is a recipe for disaster. I'd buy a simple cabinet from Ikea and do the about the same thing. 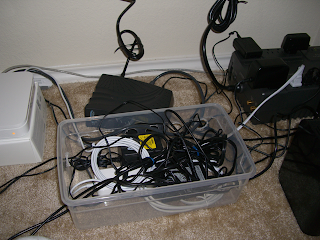 Stuff all the cables and a powerblock in the drawer. Bonus: the cabinet will also hide the outlets. 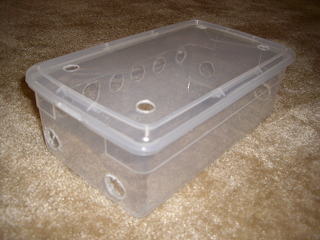 I agree that an opaque container would look even better, but I could not find a cheap opaque container. I really didn't want to spend much money! Now everything is ready if I ever get a desk or table to hide everything even more. wow, that is better. now, tell us how you get by without furniture! that must save a lot of money, too.